Hello! I’m Fiona Hall, and I’ve recently joined the Archive and Collections team as a project assistant working on the Home Front Memorial Project. I hope to share with you all exciting and intriguing stories about the lives and activities of the staff and students that continued to study at the school during the 1914-18 period. Read on for more information on the project and what I’ve been up to. 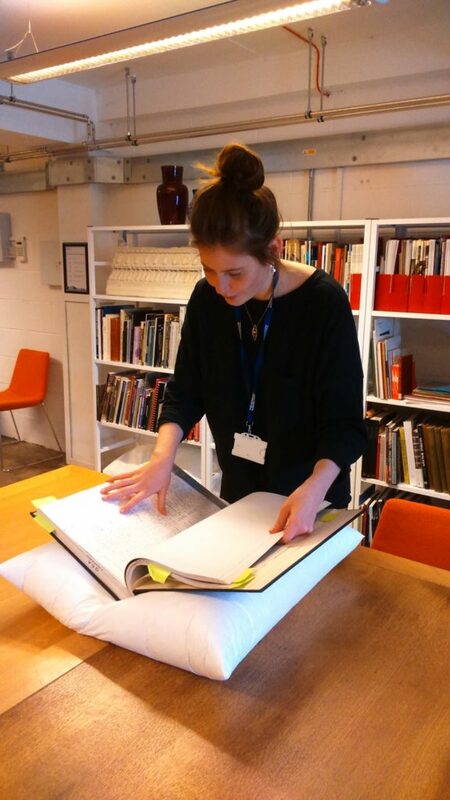 I recently completed an HLF Skills for the Future Traineeship at Historic Environment Scotland. My year-long traineeship was split into two strands; the first focusing on archival skills and working with collections and the second strand on Education and Outreach. Prior to the traineeship I knew little about the built environment but I quickly developed an appreciation for the architecture and the differing styles featured in Glasgow and Edinburgh – I now look at buildings in a completely different light! For my individual trainee heritage project, I was tasked with completing a reconnaissance of stained glass related material within the HES collections. Following some advice from colleagues and some ‘digging’ I re discovered some stained glass designs and cartoons by both Morris and Alice Meredith Williams for several churches around Scotland. I also discovered designs for regimental badges, by stained glass artists Alexander and Douglas Strachan that were commissioned by families to commemorate those that fell during the First World War. My research allowed me to develop an appreciation of stained glass as an art form and not simply just as an addition to a church or building. The Home Front Memorial Project arose as a result of the research and activities surrounding the WWI Roll of Honour project that previous Skills for the Future Trainee Maja Shand worked on; our volunteers are continuing their research into the remaining individuals on the roll. The Archives and Collections team identified a gap in the knowledge during the period of 1914-18; and realised that little is known about students and staff who contributed to Home Front Activities. Alongside an online resource documenting the lives and stories of these individuals, a memorial, acting as a partnership piece to the existing Roll of Honour will be commissioned and designed by an artist. I’ve spent my first few weeks familiarising myself with the resources I will be using on a daily basis – mainly the alphabetical student register for 1903-1919, and student records. 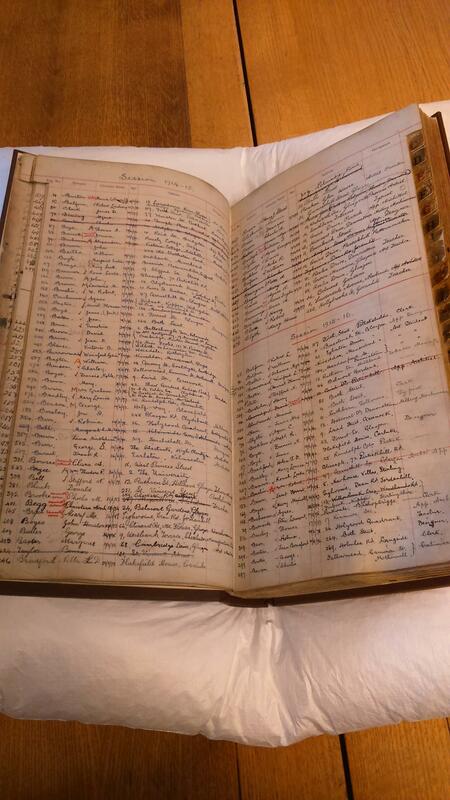 I find it so difficult to explain why looking through pages and pages of names fascinates me, but it does! I think it is because the records represent a connection with Glasgow’s past; and knowing that past students and staff may have walked the same routes we take today in town and around Glasgow is what makes me so curious about their lives. There are so many layers of history to explore! Don’t worry, I’m touching the photocopy! I have also had the opportunity to look through material relating to the Belgium Tryst organised by pupils and staff during 1914-15. I will also be liaising with Cat – who is carrying out research into the school’s international links – as I have stumbled across several Belgian students that were enrolled at the school. Click here to read about Cat’s findings so far. During my first week with Archives and Collections, Archivist Susannah gave me a tour of the Reid Building; I was so pleased that I had the chance to view the stained glass memorial dedicated to Eugene Bourdon, Professor of Architectural Design at GSA. Stained glass memorial window dedicated to Professor Eugene Bourdon, designed by Robert Anning Bell. Detail from the memorial window dedicated to Professor Eugene Bourdon, designed by Robert Anning Bell. During my previous research into Scottish stained glass I came across the stained glass artist Alf Webster, who enrolled in evening classes at the Glasgow School of Art. Webster’s career was tragically cut short when he died as a result of injuries he received in 1915 at the Western Front. While looking through the alphabetical register this week I found his details, something that I had wanted to see for a while now. This is just a snippet of what I’ve been up to so far – it has been a great first month and everyone has made me feel so welcome! Keep an eye out for another post soon.